Kate Spade iPad Mini cases are the best! Trendy, chic, and incredibly sweet, these iPad Mini covers are the talk of Fashion County, the fancy of the fabulous, and the stars of the iPad cases, all while keeping reasonably priced. All models are under $100. There’s just one problem: there are 4 Kate Spade iPad Mini case models and deciding which one is the best for you. So we’re here with some advice. We’re going to review every awesome Kate Spade iPad Mini case and give our verdict as to which of the 4 we like best. We’re hoping that through this we’re going to give you an idea of the best one for you. Practicality or style? Animal print or leather? Tough decisions, tough decisions, but we’ll help you get through them, one step at a time. This folio hard case works for iPad mini, iPad mini 2 and 3. The aqua color it has can be suitable for any occasion, whether you’re out in the town or in a business meeting. You can make sure that the solid color model lets you play with patterns on other accessories you have. Some say that this is more suitable for people who have blue eyes or wear a lot of blue. However, you can create some nice contrasts as well. You can find it on Amazon. Whether you like just classy stuff or need a Kate Spade iPad Mini case for highbrow parties, this one is perfect. The Monster Eyes case is a good way of making your iPad look cuter. It comes in a black color, which means that the eyes pop out even more. Some say this Kate Spade iPad Mini case is one of the cutest you can find. Others claim that it’s a little bit too childish for adults. In this case, you may consider ordering it for your children if they own an iPad and play with it. Keep in mind that it works for iPad Mini, iPad Air and 4 and it’s one size. You can find it online on Amazon. If you don’t like animal print models, then what about a nice floral print one? 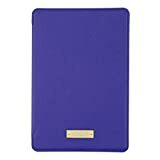 This one really does seem less-sophisticated, more-traditional than many other Kate Spade Mini iPad cases with solid colors or eyes. So if floral modeled dresses are your thing, then why not go ahead and get a floral Kate Spade iPad Mini case? However, it only suits the iPad Mini 4 model, so pay attention to that. 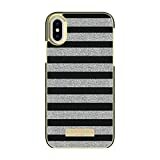 A nice touch to this case is that you can match it with other Kate Spade products such as the Falling Daisy laptop bag. The Wonderful Floral Kate Spade iPad Mini case is perfect for those who like bright colors and the smell of flowers in their life. It can be matched with any floral print model that you own. This is a good solution for the iPad mini users who enjoy having items in several colors. It draws its inspiration from the New York flag and it elaborates on the stripes. Thanks to the fact that it contains so many colors, you can match it with whatever you want. However, maybe it’s not such a good idea to match stripes with other stripes. Try mixing things up a bit. For example, you can wear just solid colors and bring a spark with the Flag Stripe iPad Mini case. Remember that this works only for iPad Mini 2 or 3 and it’s one size. You can order it online from Amazon. Which of these Kate Spade iPad Mini cases do you prefer? If you have any of them and would like to voice your opinion, leave us a comment right here. We would always love to hear your honest opinion!